1. 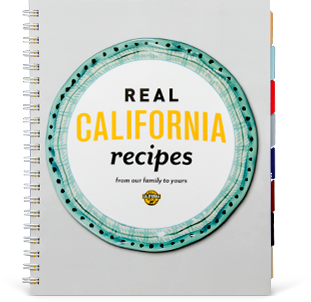 Place the sugars, heavy cream, butter, corn syrup and bourbon in a large sauce pot. Attach a candy thermometer to the edge of the pot with the tip touching the ingredients, then place over medium heat. 2. Bring to a boil, stirring occasionally, then reduce the heat to medium- low. Allow the mixture to simmer until it reaches 245-260 degrees F and is the desired color you like for caramel. If the temperature starts rising faster than the caramel is browning, lower the heat even more to give it time to caramelize. 3. Meanwhile, line a 9 x 13 inch baking dish with parchment paper and cut the corners so it folds into the dish neatly. Spray the parchment with non-stick cooking spray. Then prepare a cup of ice water to test the caramel. Once the caramel reaches at least 245 degrees F, use a spoon to drop a little bit of molten caramel into the ice water. Lift it out and test for texture. It should be firm enough to cut, yet soft enough to chew. If needed, simmer the caramel a little longer, but do not allow it to go over 260 degrees F. Once it's ready, stir in the vanilla extract. 4. Carefully pour the molten caramel into the prepared dish and allow it to cool completely. You can speed up the cooling process by placing the dish in the refrigerator. 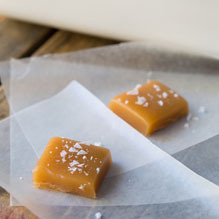 Once cooled, lift the whole sheet of caramel candy out of the dish by the edges of the parchment paper and cut into 1 inch squares. Sprinkle generously with sea salt, then wrap each candy in small pieces of wax paper.